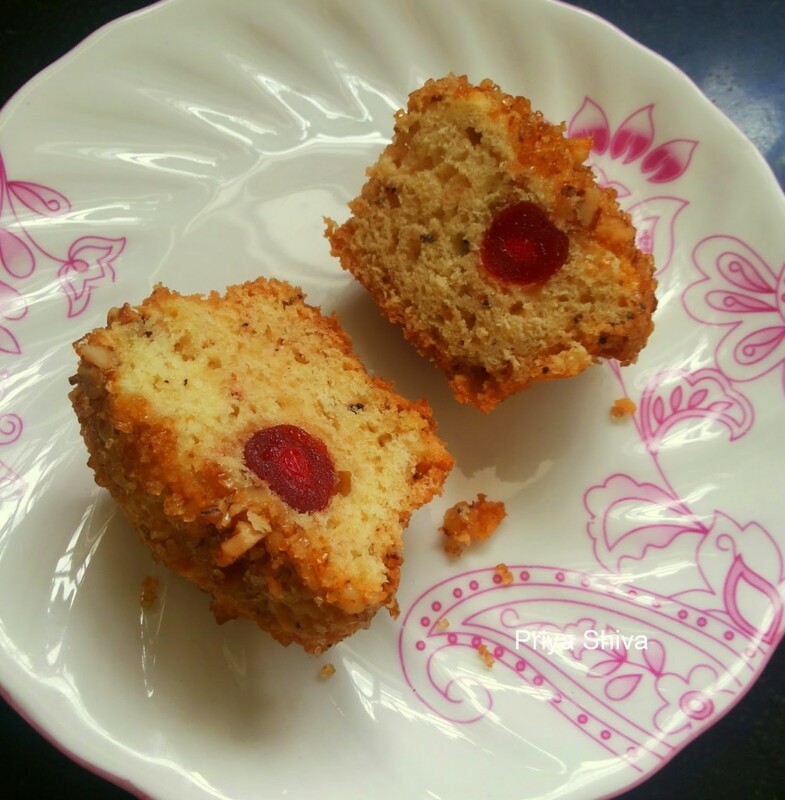 Eggless Apple Cherry Streusal Muffins are one of the best muffins I have baked and very addictive. 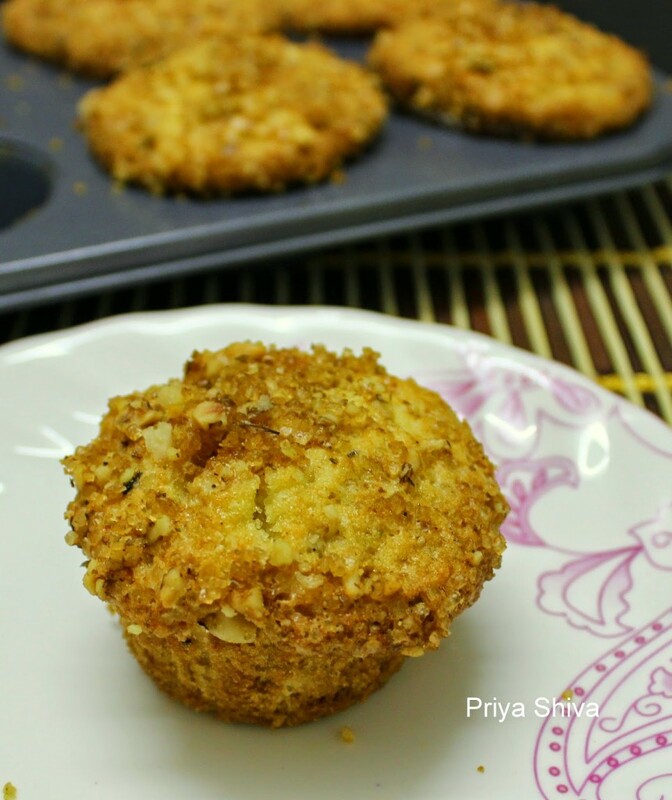 The streusal topping with walnuts adds a nice crunch to the muffins. This can also be a snack for your kids :).. 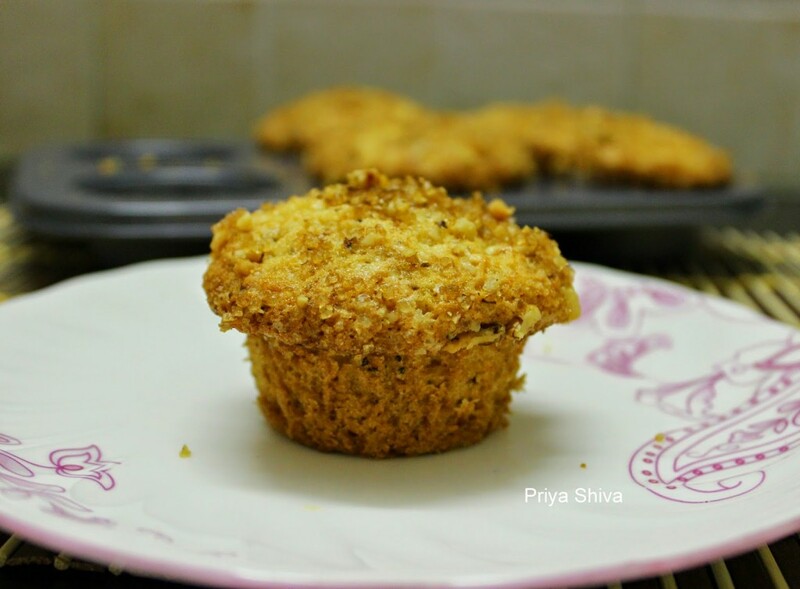 Enjoy these eggless apple cherry streusal muffins for breakfast with your family and do share the feedback with me. Preheat oven to 180 degree Celsius . Grease a 6-cup muffin tray with cooking oil or use cup-cake papers. Sift together flour, baking soda, salt and cinnamon and keep it aside. In a separate mixing bowl, beat together butter, sugar, yogurt and vanilla until smooth. Fold in apples and cherries. Add flour mix and mix slowly. Do not over mix. Spoon the batter into your muffin pan, filling tins about 3/4 full. In a separate bowl, mix brown sugar, walnuts and mix in softened butter until it looks well-mixed and crumbly. Sprinkle over tops of muffins. Bake at same temperature for 25 minutes. Check with a toothpick inserted in the center of muffin and if it comes out clean, muffins are done or bake for 5 more minutes. Let it cool down completely and then remove from the muffin tin and enjoy with you cup of tea/coffee. Do not over bake these muffins or they will be dry. Eggless Apple and Cherry Streusel Muffins sound great for the morning with my coffee! Thanks for sharing a wonderful recipe! What a decadent apple and cherry muffins. Perfect combination of ingrédients.. I am a tea lover and these treats will go perfectly with my afternoon tea. 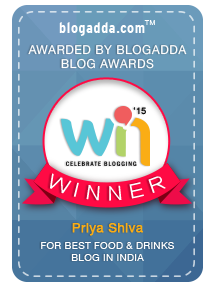 Thanks Priya for sharing! Oh my this looks amazing, I would do it without the cherry though, the kids don't like those, saving these to try for them. wow deliicous streusal dear 🙂 am first time here and happy to follow you 🙂 Liked your fb page and following you now 🙂 Do visit my blog too .. I've got to admit that this looks extremely delicious and that I need to try it. Muffins with a streusel topping is my favorite! What a nice burst of flavor that cherry adds! G'day! Your muffins look terrific and I would have to agree Priya that I too can smell your muffins from here too! 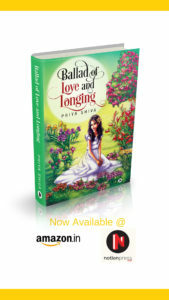 wow…it looks so soft and tasty…love it Priya! These look delish! I am looking forward to trying them. Delish! Looking forward to trying this! These sound like a really great easy breakfast idea!